One minute we're with Marcus as he tries to evade the cops who are after him. The next, we're in the mind of the killer as he torments his next victim. 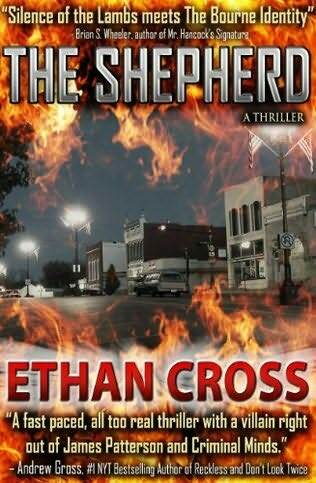 In The Shepherd , Ethan Cross takes us on a wild ride through two storylines that bring Marcus and the killer together in what seems like a fated connection, one that will make both men re-evaluate their lives and their futures. I hesitated accepting this book for review because I was concerned it might be too scary for me. It was definitely one of the scariest books I've read in a very long time, and gruesome in many parts, but I'm glad I read it. It was an excellent thriller ~ an engaging page-turner that I had a hard time putting down. I will admit that it literally gave me nightmares, but it was worth it. Although The Shepherd is a standalone book, it is the first in a future series that sounds intriguing. I'll definitely be watching for next one to come out. If you're a fan of thrillers, and don't mind a little gore, I definitely recommend this book. What scared me the most was the fact that the serial killer often hid in people's homes and attacked them there, so if that is going to scare you too much, this may not be a good book for you. But if you like a scary thriller with lots of action, check it out. This review was written based on a e-book copy of The Shepherd that I received from the author in exchange for an honest review. Ohhhh The Shepherd sounds amazing, adding to my Wishlist, don't know how I missed this one Julie.